Few people in history have prompted such seismic shifts in the art world as Andy Warhol, arguably the most Pop of all the Pop Artists. His ability to take found images and make them iconic, to present them in a style that itself became associated with him and his own persona, revealed an incredible conceptual sleight of hand. His art took notions of the readymade to new extremes; it introduced a new relationship between art and commerce; and crucially, it raised popular imagery, which had hitherto been deemed too common for a place in the world of art, onto a pedestal, and onto gallery walls. Warhol had been born in Pittsburgh, the son of a family that was part of the Ruthenian community; his parents had emigrated from what is now part of Slovakia. 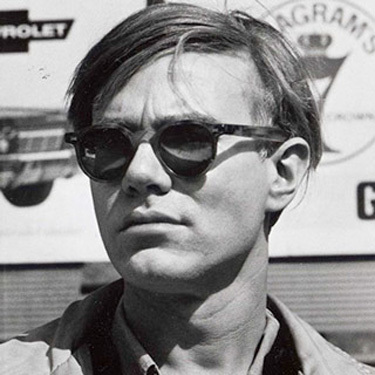 Raised in relative poverty during the Depression, Warhol eventually made his way to the Carnegie Institute of Technology, where he studied pictorial design. In 1949, Warhol moved to New York and managed to secure work making illustrations for various publications, eventually being employed by I. Miller and Sons. It is no irony that Warhol had enjoyed a highly-successful career in advertising before he turned to art. His early works in the Pop vein involved adverts, newspapers, cartoons and comic strips that he reproduced in paintings; however, he was disheartened to find that the dealer Leo Castelli had already seen similar works based on comics being created, by coincidence, by Roy Lichtenstein. Discovering this, Warhol turned from comics to Campbell’s soup, and the history of art took a new turn. Warhol’s early paintings were often painted by hand, sometimes using a projector. Taking found imagery and rendering it in paint that often had a gestural quality allowed him to reveal the artifice at work. These works were gleeful affronts to the dominance of Abstract Expressionism, with its focus on the artist’s touch, on avoiding figuration and on avoiding commerce and popular culture in favour of universal, mythic cores. Warhol instead looked at the objects that surrounded him in everyday life for inspiration, be it newspaper covers, dollar bills, Coke bottles or Campbell’s soup cans, increasingly turning to stencils and rubber stamps in order to achieve a regularity of design, eventually moving on to the silkscreen process with which he has become so firmly identified. In his first one-man show, held in Los Angeles’ Ferus Gallery in 1962, a series of his Campbell’s Soup Cans was shown, presented in shelf-like displays. Although one was initially bought by Dennis Hopper, Irving Blum later arranged to secure the group in its entirety; it is now one of the most important works in the Museum of Modern Art, New York. That year, Warhol began to create what remains perhaps his most iconic image: his Marilyns. Long fascinated with the glamour of Hollywood, Warhol’s pictures of Marilyn Monroe showed her in deliberately lurid colours shortly after her death. This added a complex layer of meaning to his seemingly inscrutable works. Themes of death and consumerism often underpinned his pictures, not least in the celebrated Death and Disaster series that commenced the same year, for instance in Tunafish Disaster works, and his subsequent Suicides and Car Crashes. From 1963, the machine aesthetic embodied in Warhol’s silkscreens was extended to his ‘Silver Factory’, the studio space he occupied in an abandoned fire station until 1968. With its walls painted silver, augmented by silver foil and mirror, the space was the antithesis of the paint-strewn studios of many of the artists involved in Abstract Expressionism at the time. The Factory became a significant hang-out, a centre for Happenings, a film studio, a party zone. It was a cultural hub, the centre of Warhol’s increasingly multi-media empire. During this time, he also began creating more and more films, while also collaborating with the Velvet Underground and filmmaker Jonas Mekas. Some of this frivolity would come crashing to an end with the attempt on his life by Valerie Solanas in 1968. Thereafter, Warhol’s circle was increasingly vetted, and he became an increasingly gnomic and distant figure, establishing the persona that remains so recognisable to this day. Despite this, Warhol was responsible for raising the profiles of a range of stars, starlets and artists over the years, from Edie Sedgwick in the 1960s to Jean-Michel Basquiat in the 1980s. Warhol claimed to have abandoned pictures in favour of movies, yet continued to create works throughout that time, and afterwards. Some of his works explored notions of celebrity, such as his Mao series, while others toyed with the nature of abstraction, for instance his Shadows and his oxidation works, created by urinating on copper-based paint, a technique that parodied the machismo of the Action Painters. In the late 1970s, his own works had become iconic enough that he began to create Reversals and Retrospectives, in which he turned to his own works, revisiting themes from earlier in his career, the Pop maestro marking his own ascension into the cultural pantheon.